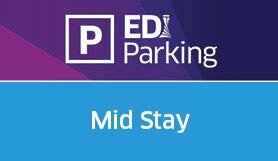 Edinburgh Mid Stay car park is an excellent choice for parking close to the terminal. Suitable for travellers going on shorter trips or for business users. Simply park and walk to check-in or security - there's no need to get on a bus, or hand your keys over. Please take a copy of your booking details with you on your day of travel.